HELP THE DYING IN HAITI! Cholera is an acute intestinal infection caused by ingestion of contaminated food or water. It has a short incubation period and can quickly lead to severe dehydration and death. In most cases, treatment of cholera is a relatively simple process of replacing lost fluids with clean water and rehydration salts. If not treated, 60-70% of cases will be fatal. With proper treatment, that drops to less than 1%. During this epidemic in Haiti, the fatality rate has been about 7%. This is a direct result of inadequate treatment facilities and human resources. The Mission is now preparing a medical response to this crisis. We have a volunteer medical practitioner available for a two week period, but we must obtain resources for transportation, initial medical supplies, and other associated costs. 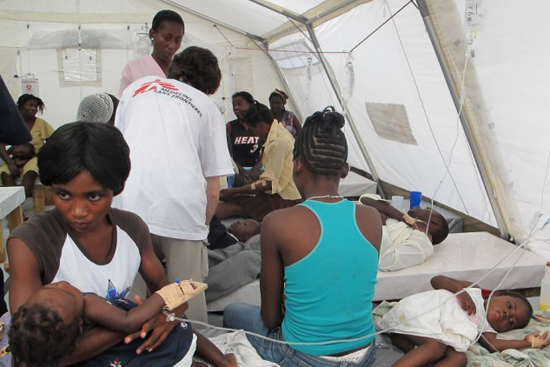 Our current estimated cost to operate a cholera treatment center for two weeks is $10,000. If additional funds can be obtained, we may be able to continue operation of the treatment center beyond the initial two weeks. In the Gospels, Christ consistently reminds us of the necessity of caring for those in desperate circumstances. In the parable about the Good Samaritan, we are instructed in how every living human being is our neighbor. And in the parable about the Rich Man and Lazarus, as well as the Gospel concerning the Last Judgment, Christ speaks directly to those who would neglect these duties.